The O2 XDA II is O2's second generation combined PDA/phone and is a huge improvement over the original XDA model. Firstly there's a complete software upgrade, taking the O2 XDA II to Windows Mobile 2003 for Pocket PC. It has a 400MHz Xscale processor and a huge 128Mb RAM. On the hardware side, the O2 XDA II includes a 640x480 pixel digital camera, and it has a large 240x320 display in 65,000 colours. Memory expansion can be done through SD and MMC cards. The XDA II measures 130 x 69.9 x 19 mm and weighs 190 grams, which is large for a phone but pretty standard for a PDA. The original XDA suffered from poor battery life, but the XDA II is significantly better. Talktime is up to 5 hours, and standby time is about a week making the O2 XDA II much more practical for the business market. Also with business in mind, the XDA II comes as a tri-band phone so it can be used in most places with a GSM signal, plus the XDA II comes with GPRS, Bluetooth and infra-red. 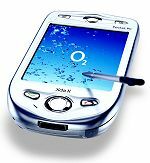 If you have an original XDA, then it might well be worth considering upgrading to the O2 XDA II. If you're in the market for a really smart smartphone, then the XDA II is well worth a look too!